10/30/16: Added Complex Pants Decklist, changed intro, updated adrieng's sideboard strategy and decklist. Changed Apple713's sideboard. Moved not of this world to protection. Moved tainted pact to rejected cards. 9/6/16: Added spooky's decklist, removed "Plan B Deck", and added summary of versions. Changed the number Ratio's of match descriptions to lexical descriptions to better represent and describe the matches. 1/11/16: Updated Chalice of the void (protection), Acceleration and Land Section, Sideboard options Section, Updated Stock Decklists. Dark Depths is a combo deck that that tries to generate a Marit Lage token (20/20 Flying Indestructible) by either removing all of the counters with vampire hexmage or by creating a copy of dark depths with 0 counters using thespian’s stage. I consider this deck to be a very strong choice because it is very resilient to traditional combo hate like counterspells and discard. Additionally it has the speed to keep up with other combo decks, and the versatility to adapt to a changing meta. Due to the limited number of threats the deck is concerned about it can focus on eliminating those in the main deck while maintaining consistency. The combo was first introduced when vampire hexmage was printed in zendikar. At that time Thespian’s stage had not been printed and the deck was a 2 card combo with much less consistency. At that time it is also important to note that crop rotation was banned. Even when crop rotation was unbanned the deck did not materialize. It was not until Thespian’s Stage was printed in Gatecrash (Feb 2013) and shortly after the Legendary rule changed (March 2013) did the deck start to receive attention. The change in legend rule allowed a player to copy Dark Depths with Thespian’s Stage and keep the Thespian’s Stage copy with 0 counters immediately generating the token. The combo has seen some success in variants of Eternal Garden (Lands.dec) however that deck is an inappropriate shell for a dedicated combo deck. It does not properly exploit the consistency of having vampire hexmage and it leaves itself susceptible to the ever increasing amount of graveyard hate present in the meta. Complex Pants has now put this deck on the map by winning eternal weekend 2016. Dark Depths: the namesake and sole reason we play this deck. 20/20 Flying Indestructible is the biggest baddest fatty in the game. 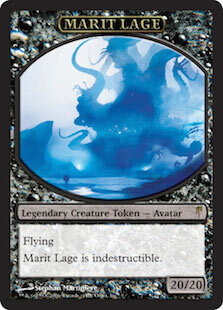 Thespian’s Stage: Copies Dark Depths to make Marit Lage token, copies any other utility land you OR your opponent has in play. Common targets are maze of ith and ghost quarters. Vampire Hexmage: Removes counter from Dark Depths to create the Marit Lage token. Also serves as a good blocker because of first strike, and can remove planeswalkers. Since the printing of Thespian’s Stage we now have two cards (vampire hexmage) and are able to increase the consistency to a point where Dark Depths becomes reasonably feasible and desirable to play. Crop Rotation: This is single handedly the best tutor for the deck. For the cost of 1 green mana you instantly get the missing combo piece or defensive card you are lacking. The land come into play untapped so it is essentially free. Expedition Map: Although it is slightly more costly than sylvan scrying it allows you to search with colorless mana which is especially important under blood moon effects. Sylvan Scrying: 1 mana less than expedition map but requires green, which is not commonly an issue. Ancient Stirrings: An alternative to the direct tutors that are traditionally used. It also allows a player to grab pithing needle or expedition map as well as filter cards to the bottom of the library to take better advantage of sylvan library. Use if you need to increase the speed of your deck. Currently no deck runs this but it is an option. One very attractive attribute about this deck is that there are only a few threats this deck cares about and that makes protecting against them much easier. The top threats are Wasteland, Swords to Plowshares, and Karakas. Some of the less common threats include bounce spells, Maze of Ith, and Humility. Pithing Needle: defends against the major threats to this deck. Wasteland, karakas, maze of ith. Also has application in extending game by hitting deathrite shaman, liliana, sneak attack, Griselbrand, aether vial and others. Inquisition of Kozilek:one of the best ways to defend against swords to plowshares and fast combo decks. Also useful in taking creatures to slow down tempo decks. Not of this World: Amazing at protecting the token from everything (swords, karakas, venser, bounce) especially since it is free. In the current meta there are a lot of these due to D&T and Miracles. Some decks are running it main and other in the side but it has become a staple in the 75. Abrupt Decay: Replacing krosan grip because omnitell has fallen off the map, abrupt decay hits most of what you want to target and is uncountable. It is amazing against miracles to deal with counterbalance and can provide time against decks tempo decks like delver. Red Elemental Blast & Pyroblast: With the overwhelming popularity of blue, having these main helps against counterbalance, delver, show and tell, bounce spells, and other miscellaneous targets. Sejiri Steppe: Can be used crop rotated into to protect Marit Lage from swords to plowshares and other bounce spells AND can be used to give protection from blockers allowing him to attack through a wall of delvers or flickerwisps protected by mother of runes. Maze of Ith: Can be used to buy ALOT of time against single threats that would normally close a game. sometimes that time is all you need because you already have the combo in hand. Delver, batter skull, tarmogoyf, reanimator, knight of the reliquary. Note this can be copied by Thespian’s stage until stage needs to copy dark depths. The Tabernacle at Pendrell Vale: Slows opponent down by forcing them to make difficult decisions restricting their ability to overwhelm the board. Limiting threats also makes maze of ith more powerful. Ghost Quarter: Since we expect pithing needle to be on wasteland we can still use this to destroy opposing Karakas and maze of ith. Note that this can be copied with thespian’s stage to keep opponent off of mana. Can also be used to search out a basic forest in your deck. *Although maze of ith and Tabernacle of pendrell vale don't get you closer to creating the token the small inclusion of just a few cards grants a vast amount of protection that is difficult for most opponents to deal with. Recommended stock mana configuration: 24-28 Lands. For each color you want to include you should have at least 10 lands that produce that color. Fetch lands are included in that count. Three mana bases are below. The first thing you'll notice about this is that it runs slightly fewer lands but compensates with lotus petal / elvish spirit guide. These can be factored into your mana sources at 1/2 value since they are temporary. For example, 4 lotus petal would only add 2 to the colored mana count instead of the full cards. This can be customized to fit one's own playstyle of course, but this is considered the stock manabase. Urborg is almost as important as the combo lands. Turns your non mana producing lands into mana producers. Allows you to cast hexmage on T2 with a dark depths in play for a turn 3 win. Allows you to use Gemstone Mine and Mana Confluence for black with no drawback. Some versions of the deck plays three colors, mana confluence, and gemstone mine are essential to being able to cast what you need when you need it. Copperline Gorge has a place here because it replaces other forests leaving you less susceptible to Submerge. Submerge is in ~10% of the metagames sideboard, meaning its in almost most delver sideboards. The BG version runs Bayou's and fetch lands and is more susceptible to submerge but that can be played around if you expect it. At least 1 forest is needed because it can be searched for with expedition map under blood moon. Rishadan Port: Very good way to deal with opposing Karakas and Maze of ith. Can keep opponent off of white mana to cast swords to plowshares or simply keep a combo deck off of mana until you can make the token. Karakas has been in and out of the main board depending on your meta. The basic skeleton is below and should be followed closely to maintain consistency. The numbers can be +/- 1 maybe 2 but remember that the greater the deviation, the less consistency you will have with the deck. 8 -12 tutors provide a very consistent basis for assembling the combo very quickly. Recent Versions have been only been using 8 4Crop Rotation 4 Expedition Map with no reported loss of consistency. So, if you need to make room for other cards you can cut the number to 8 but I would not go less than that. 5 additional draw spells aid in consistency. Sylvan library has been the typical choice because it allows you to recover quickly in the event of swords to plowshares. Sensei's Divining Top works as well since it is not dependent on green mana. Usually a split between the two is appropriate. 13 Flex spots / Protection - This is where the deck is having issues. We have tried various mixes of duress, inquisition, red elemental blast, and carpet of flowers but we are getting crushed by other combo decks. Note that this number includes Pithing Needle which are normally an auto include. RG Combo lands which has similar combo matches as this deck runs 6-8 anti combo cards in the SB and they say it seems to work for them. 2-4 chalice of the void 2-4 Sphere of Resistance are most common. 10 lands that produce a given color can support 12-15 colored mana symbols. 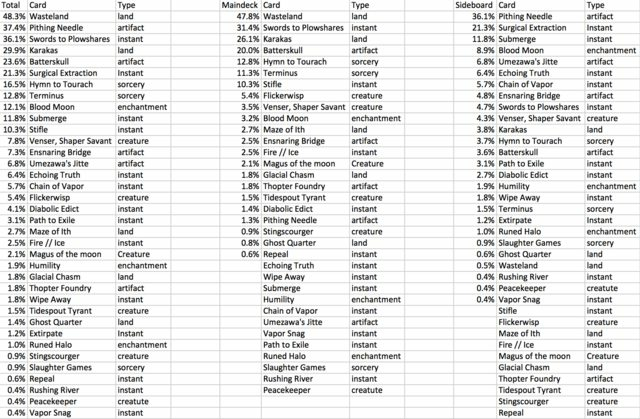 The list below has 15, but most iterations have at least 12 and there has not been an issue of colored mana. 4 utility lands is probably the minimum you want to run. Feel free to run more but adjust the manabase if you do. There is a huge amount of options in the deck's colors. However the deck has a limited number of issues and you shouldn’t let the options overwhelm you. I will try to list the ones most relevant in the current metagame. Abrupt Decay: Although many decks are choosing to run this main, if you are not it should almost certainly be in the sideboard. Abrupt decay is actually my new favorite card EVER. Its amazing against Miracles and amazing against tempo decks. It also hits a lot of random things in between. The card buys us time against tempo decks which has often been a race. It's also creature removal against difficult matches like D&T. I really couldn't imagine playing a deck without it in this meta. Reclamation Sage: Hits enchantment threats, blood moon being the most important. Although it can hit sneak attack too, pithing needle usually takes care of that. Ancient Grudge: Great for hitting multiple artifacts that may slow us down like pithing needle, phyrexian revoker, and ensnaring bridge. Toxic Deluge: Arguably the best answer against Death and Taxes' and other tribal-strategies, especially Elves! Pyroclasm is also very good against delver decks, hitting many of their threats like shardless agent and deathrite shaman. Pyroclasm: 1 less mana than toxic Toxic Deluge and hits most of the same targets. Against fast decks like elves this is preferable. Bojuka Bog: Great 1 of to sideboard in against dredge, reanimator, loam strategies, and other possible grave based decks. Karakas: Good 1 of to sideboard in against reanimator or Sneak and Show. Although those are tough matchups, Karakas has little application outside of them. Hits vendillion clique, thalia, and venser. Krosan Grip: Important if you are not running Abrupt Decay main deck. Pernicious Deed: Excellent against miracles and various other creature based or permanent heavy decks. Chalice of the Void: Helps protect against Swords to Plowshares and helps in combo matches. Against ANT / Storm Combo you can play it for 0 with similar effect as on 1 but without restricting your lines of play. Sphere of Resistance: Good inclusion vs Storm / combo matchups by slowing dig. Often times you lose to combo decks by 1 turn. This can buy you that time. Tabernacle at Pendrell Vale: More often it seems to be a sideboard card if run at all. Consider it against decks with either a large number of creatures or a very tight mana base. Dredge, Tempo, D&T, elves. Surgical Extraction: has been good vs reanimator decks and decks that have the ability to recur wasteland / swords to plowshares (via snap caster). You can bring it in against dredge, reanimator, RG lands, and various other decks. Consider these cards when selecting the flex spots and sideboard choices. I've chosen to include an exhaustive list just to alert you to cards specific decks run that you might not think of. Slaughter Games is a good example. A link here to an excel file show the % of the format these threats make up. The data is for March and you will have to download it. An explanation of how to read the information can be found here. Submerge is a non issue because we only run 1 forest and decks running submerge are not getting to 5 mana. Hymn was included because it can hit land cards and that may affect the turns you make your land drops. *Submerge may be seeing less play now and it has not presented itself as a real issue in a deck with more forests and Bayous. I have provided several lists below to demonstrate the varying use of the Flex-Spots. Complex Pants has taken the original approach which really got this deck started back when thespian's stage was first released. It is an ALL IN turbo depths approach. It is easily the fastest version and can use that speed to win games a turn faster than the other versions, which is critical in some matches. This deck makes excellent use of all of the variable deck slots. It reduces inefficiencies and has optimized its choices to be applicable to the broad spectrum of decks the legacy meta presents. It has been optimized by adrieng and does a really good job dealing with the decks shortcomings. This version is intended to handle the late game better than the other versions because of the the liliana's of the veil and 4x main deck abrupt decay's. If the game goes longer there is more to do with this version than the others. Against combo decks a liliana is the end for them. This deck focuses on hand disruption which is great against combo and control decks (generally our worst matches). Abrupt decay is main deck because of all the tempo decks in the meta as well as miracles. More can be read about my choices here. This is slightly different than the other two lists. This deck successfully has incorporated brainstorm into the list. Information and tournament report can be found here. In summary, you can basically build this deck almost any way you'd like. Several different version of various speed have seen success and honestly it comes down to knowing the deck very well, knowing the opponents deck and what specifically you need to do to beat them, and executing it. The main thing these decks all have in common is that they all run full 4x crop rotation, vampire hexmage, dark depths, and thespians stage. These cards are all to valuable to exclude and as such the deck builder is forced into at least Green and Black. Until hexmage / crop rotation can be replaced by cards in other colors the decks will remain fairly similar. Lands.deck shell: Since the deck is primarily a control deck it’s focus is divided and too slow. It also leaves itself open to grave hate. Note that Apple713’s deck includes Loam but it is not to be used as a primary strategy. I have played versions with gambles, entombs, life from the loam and while having direct tutors is very nice it crutches on the graveyard too much and was highly susceptible to blood moon. Living Wish: Decreases consistency of drawing into the combo naturally (which is ideal) and slows down the deck. Also makes you more susceptible to counterspells. Mirri’s Guile: I had originally included this in a previous version because it was cheaper and supported the speed aspect of the deck however for 1 more mana you get sylvan library and the card draw it provides is significant. Into the North: This is great because it puts any snow covered land directly into play. While it does get Dark Depths, it does not compare to the versatility of sylvan scrying. This has seen play as a 1-2 of in some versions. It is intended as supplemental after 4x crop rotation and sylvan scrying. Fling | Rites of Consumption: This card circumvents all forms of removal regarding the token. However, it has proven too slow for the Death and Taxes and poor against miracle because of counterspells. Against death and taxes at best it will cost 2 mana hexmage 2 mana rites. With thalia, that increases to 5mana, and without hexmage thats 6 mana which is a lot against a deck that taxes lands like D&T. Secondly they can just sword one of their creature to be above 20 life anf you need to fling twice :(. Ethersworn Canonist: Mainly used against storm decks / omni. Basically we draw them at the same pace they draw the answers but since they have better dig engine they are better off. Gaddock Teeg: Mainly tested against storm decks / miracles. Basically we draw them at the same pace they draw the answers but since they have better dig engine they are better off. Mixed with the mana fixing issues its not the answer we are looking for. Meddling Mage: Seems ideal against combo / swords to plowshares but the mana cost is a real issue. It doesn't do enough work by itself to really justify a SB slot. Tainted Pact: Adrieng says "The main idea was to have something which could be both disruption and combo pieces ; but I have concluded that it is better to have a good amount of both without something which is a bit random and slow. Adding some top does a better job here also I have prefered cutting it with library for more disruption cabal therapy increase of combo density with probe"
Land drops in our deck are more important than any other deck. Always keep in mind the order you play them. They can also be played in an order that would keep the opponent from knowing what deck you are on, or at least until it is too late for them to respond appropriately. The majority of the time you will want to wait till the end of your opponents turn to make the token. Dont forget to use stage to copy utility lands like maze of ith and rishadan port until you get dark depths. Stage does not lose it’s copy ability when it copies something. If your opponent casts pithing needle and you have a thespian's stage in play, use the Thespian's Stage to copy any other land in response. Since Thespian's Stage copies the name of a land as well as its other text, a Thespians Stage that has copied another land will be able to use its ability to copy Dark Depths at a later time as long as you opponent didn't name the land you just copied. Additionally, if you have Thespian's Stages sitting around that have not copied other lands, try to copy other lands with extra mana to avoid getting shut out by pithing needle. The best way to work around wasteland is to make the token in response to them activating wasteland. 2 ways to force them to activate it is to either destroy their wasteland or attempt to make the token, have them activate wasteland, then make the token again with a second stage or a hexmage. Don't forget you can copy an opponents wasteland with a thespian's stage and use it against them. Also, bait opponents by playing one of your combo pieces and waiting for them to target it. Once they do cast crop rotation sacrificing that land. If your opponent does not have a wasteland in play but you know they are in the deck consider making the token on your turn if your opponent does not have a way to kill your token. RUG delver is a great example, but watch out for stifle. There really is no way to play around these. Hope to draw a pithing needle or wait until end of turn and then destroy it or tap it with Rishidan Port. Sylvan Safekeeper has been used effectively in lists running Green Sun Zenith. not of this world has also gained favoritism recently. Changed Ratio's to literal descriptions of matches to better describe the match result - Please PM / post if you think these need to be changed. Knowing what your opponent is playing is critical in this deck to really be able to make the best use of all that it has to offer. Knowing when to make your token and if the opponent has main deck or sideboard answers can make or break you. TLDR: favorable matchups vs the majority of the field, except D&T, Miracles, S&T, Ad Nauseum, Omni, and Painter. UR can't stop Dark depths combo. They don't run wastelands like traditional delver lists. Play around daze. Post board watch out for Price of progress / blood moon. more difficult than UR because of wastelands, and stifles. The deck has no way to deal with a depths token pre or post board so try hard to just resolve 1. they are not likely to have 5 mana to cast submerge. Easier than RUG but not as easy as UR. they don't typically run wastelands and swords is the only real issue. batter skull can force you to have to attack more than once so make sure to bring in artifact hate. BUG delver is a little harder than traditional shardless bug just because they run similar threats to RUG delver. Wastelands, and some stifles. They are not nearly as bad because fewer obstacles to overcome. Depths eot isn't something they have an answer for. Hexmage hits liliana too, but she's not usually an issue. very similar to UWR. Sometimes runs wastelands. G1 is pretty bad but post board there are a lot of answers. Play carefully and try to get them to overcommit to maximize your deluges / pyroclasms. Maze helps went them off here. Winning fast is highly unlikely. This match isn't terrible but can be problematic. Pithing needle on Sneak / griselbrand, and tutor for karakas. G1 should be easy, but post board they have blood moons, bounce. similar to S&T but you can also bojuka bog them. pithing needles on griselbrand and crop rotations for karakas are ideal. Watch out for tidespout because he’ll rock you. this matchup isn't good because you are essentially racing. You have discard but they can win through the discard. bojuka bog for past in flames. similar to Ad Nauseum but slightly better because blasts help a lot. They have bounce you need to play around. Not great because you are racing and once they S&T they win and you can't really interact especially g1. G2 you’ve got reclamation sages and can increase discard but they also have leyline of sanctity. Matchup may be better than 55:45 but i haven't had significant testing. this deck has answers to everything you want to do. Terminus swords snap caster to recur swords, and sometimes venser. The main issue is sensei's divining top so needle that and you shouldn't have too much trouble. You are similar in speed to them but you board in lots of removal which makes it very hard for them to win g2-3. usually pretty good match because you are faster and more consistent. Try to play around price of progress by making the token when they tap out. This match is pretty easy because they play dark depths and you can crop rotation into thespian stage to copy their dark depths and steal a victory. They can do the same so unless you have an immediate use for dark depths don't play it. Bojuka bog helps if they try to wasteland lock you but often times you are much faster. They can be faster than you so try to keep a hand where you can crop rotate for bojuka bog. Sejiri steppe gets through narcomeobas. so this is probably the worst matchup but still not that bad. forest is an essential target here because if you cant blow up their moon effects, you lose. Rachel bomb helps under moon and expedition map as well. Needles are ok but ancient grudges allow you to get a lot of value. If you can make your token quick before blood moon great beaus their only out of bridge at that point. Otherwise you are in for a more grindy matchup. Try to save grudges for when you absolutely need them because painter can win very quickly out of nowhere. I have taken this directly from Sneak & Show thread because even if you do not read that thread you should still know this information. Now on to distinct Turn 1 plays. I will concentrate on the decks I covered in the matchups-section, but might mention other decks if the described play is very characteristic for them, too. This is relevant to legacy in general but it is important for you to be able to identify the deck your opponent is playing so you can anticipate the threats they have in their deck. Knowing this information helps you determine things like when to make your token. Although it does not sound like much that is one of the most important factors in this deck. Fetchland - Volcanic Island - Delver of Secrets: You can be 100 % sure you are playing against a Tempo strategy, most likely RUG or UWR. If the fetchland was white, UWR is more likely, if it was green, RUG is more likely. Still, that doesn't matter, since game 1 plays out pretty much the same against those two. Underground Sea - Ponder: ANT, TES, Reanimator, Team America. Esper Blade sometimes has a 1-of Ponder as well, so that's also possible. Note: If the Underground Sea gets fetched with a Marsh Flats, you are most likely not playing against a BUG deck. Rishadan Port / Karakas / Plains into Aether Vial: Death and Taxes. Rishardan Port - Vial could be Goblins as well, but Death and Taxes is far more likely in the current meta. Volcanic Island - Ponder: Be prepared to play the mirror. Note that it might just as well be UWR Delver or RUG Delver, but be cautious to cast Show and Tell until you saw more information. Tropical Island - Ponder: RUG Delver, Team America or Bant. If the Tropical Island got fetched off of a Windswept Heath, it's 100 % not RUG Delver or Team America. Team America is pretty unlikely anyways, since they won't fetch up Tropical Island on turn 1 to have the opportunity to Hymn to Tourach on turn 2. Last edited by apple713; 08-09-2017 at 11:52 AM. Some rectifications you can make but they are not very significant I play a third reclamation sage in side in the duress spot. And I am not sure of the maindeck tabernacle maybe in side (don't have a lot of test with it). In the jund matchup I also bring some ratchet bomb in the duress slot. -2 duress -1iok +3 ratchet bomb (answering needle) and sometimes 1 deluge on the play. In the Ur delver matchup I bring 2/3 reclamation sage for 2/3 library answering thinks like blood moon. Awesome, thanks for this! I'm bringing the first list you posted to my LGS tomorrow and hope to crush some people with Marit Lage in our weekly Legacy tournament! Thanks. I have made the changes to reflect your comments. Instead of tabernacle do you think it would be better to run a main deck sweeper like deluge or pyroclasm? Against combo, tabernacle is dead anyways. Against aggro, deluge might actually buy more time depending on how late game it is. While i favor deluge over pyroclasm because it has application against S&T it is slower, but the slowness aspect is typically only relevant against elves. The other option would be to include Karakas in its place. Karakas helps reanimator, and S&T, but little else. When i had it main i ended up taking it out a lot. and the tabernacle in his place in side. Someone asked me also what about playing Chain of mephistopheles in side for all these cantrip.decks. I think there is no space but can be a meta concern like some choke in side for miracle/blade.deck metagame. Chains also hurts our Library strategy, so we'd have to be all-in on a singleton (or 2, tops) Chains stopping opposing card draw, leaving us to forego our only source of draw. Might hurt us more than it helps? You are supposed to bring one-two against combo with cantrips/griselbrand and UR/Bug delver they should take the slot of library or dead cards after side. I haven't tested that but UR/Bug delver are already favorable matchups but combo is harder. Anyway the side is already full of good cards, there is maybe the tabernacle slot which I am unsure for now. Every thing else is proven to me. Nice primer! Will you be putting up other sample-lists or did the old lists fall from grace? Love your list by the way! EDIT: Into the North will get you any Snow-Covered land. Just a minor detail. Chains just isn't good enough, ever.... if it was a leyline type card it would be so much better, but since the opponent gets at LEAST 1-2 turns to cast cantrips, against combo decks its not great. Against tempo strategies, they have threats that are more important to deal with. If chains was a creature it would be amazing!.... oh wait spirit of the labyrinth still not good enough to see widespread play. I feel like if this deck were to be improved it would be through the 9 flex spots. I put the following in the primer, but i didn't draw attention to them. Are there cards that would fill the roles better than discard / red blasts? In testing against a few friends they questioned the need for red in the deck. Are there any blue cards we're incredibly afraid of? Having tutors get countered is annoying, but not semi-backbreaking like eating a Swords to Plowshares. Discard effects can take counters if we are that worried. I realize the Blasts also kill flipped Delvers and Cliques to clear the way for the token. Having access to red sideboard cards like Grudge and Pyroclasm is nice, but Grudge can be replaced by more Sages/Krosan Grip, and Pyroclasm can potentially be replaced by more Deluge or Engineered Plague (Elementals vs UR Delver, Elves vs Elves, Human vs DnT). I'm not saying that red is definitely replaceable, I'm just playing devil's advocate to spark some discussion. I personally like the deck as-is, but it's worth discussing. maybe I should add a comprehensive list of problem cards the deck encounters in the meta? That would probably make it easier for people to generate ideas on how to deal with the most common ones main deck. I'll add this section to the primer when i have some time. Feel free to make suggestions on other cards to be on the look out for. i've added the section "Issues the Deck Faces"
counterspells don't really affect this deck. Mainly its because we can draw into the combo and the land drops are uncounterable. Lands cannot be discarded either. Its really awkward for opponent when they duress you and see you have the combo in hand and then just concede because their deck literally has 0 answers. Right, that's why I listed them toward the bottom. They can slow us down by countering a Library or making us discard tutors, but there is very little they can do about us naturally drawing our 4-of combo pieces, which are lands. That's why I raised the question about the need for maideck blasts/red in general. I think Terminus is actually a pretty big annoyance, and isn't something we can really do much about, aside from Needle on Top to only leave them Brainstorm as an out. Edit I'd also add Port to the "less likely to encounter" cards, depending on how represented DnT is in a given meta. so i compiled some data but I'm not sure exactly how to make the best use of it. I took all of the cards in the meta from mtgtop8 for all of 2014. I separated them out by total, main deck, and sideboard. I figured it might be useful to ensure that we pick the best cards to combat the threats we are most likely to encounter. The only thing i don't think the data takes into consideration is how harmful each effect is to our deck. Let me know what you guys think about this. I can link the excel file if anyone wants it, just pm me. Forgo to mention that Extirpate/Surgical Extraction post board is kinda lights out for us, no? true however, i can't say that I've ever been too worried about that extreme corner case just because i'll usually be able to get 1 token out of it. are there decks in which we would need to make multiple tokens that are running surgical / extirpate that we should be worried about? Well any deck can run Surgical. Extirpate is definitely more niche, which is good since we can't really do anything about it. All a deck has to do is Waste Depths or Swords our token after we make one then Surgical us out of the game. Slaughter Games is game over as well but hopefully we win by turn 4, as Jund is typically the only deck running that in the board, and we have access to discard.